Friday, August 31, 2012 . I’ve been a long time fan of Hable Construction (in fact I think I was one of their first customers, no kidding). Sisters Susan (left) and Kate (right), as seen in the photo above, run this brilliant textile company which creates bags, pillows, custom upholstery, and now tech covers. Their flare for design is so inspiring. Hable textiles are always so fresh and unexpected which I really appreciate. I also love their signature beads collection, one of each please! I had the pleasure of touring Susan’s home in Athen’s GA. what can I say, I could move in tomorrow. I am hoping to see it featured in a major shelter magazine soon, it’s amazeballs. The thing about their awesome style is that it really is the definition of classic modern design, therefore it never goes out of style. Things I bought 10 years ago are still as fresh today. Their style rules, so if you don’t know them check them out…and if you do then check out what’s new in the line. Thanks ladies, I’m a big fan! P.S. 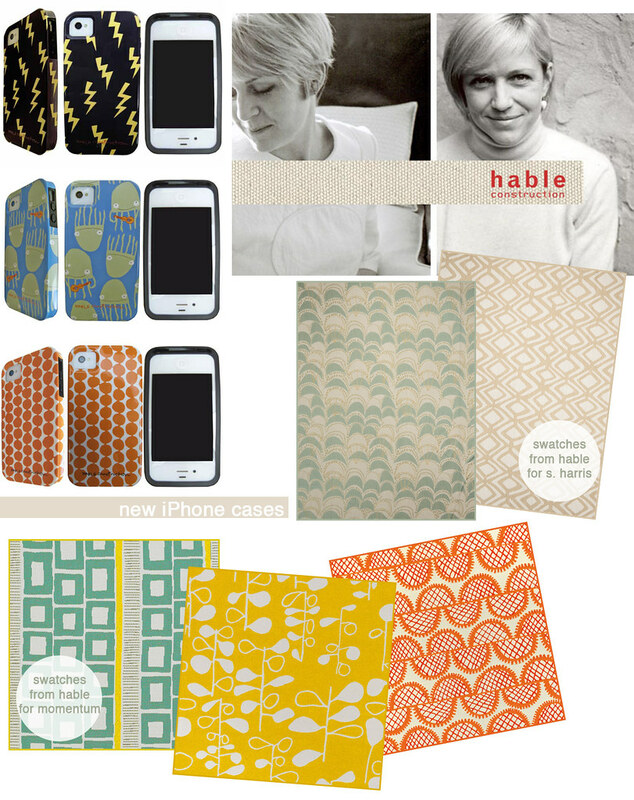 One of every iphone cover for me please…I’m crackin’ out the amex. Check out their upholstery collection for Momentum Textiles here. Check out their upholstery collection for S. Harris here.